But no, seriously. Common knowledge Herschell is a cat – in that bar at least. Ha ha ha. Ha ha. HA HA HA HA HA HA HA HA. Now Herschall’s even more adorable. I just wanna kidnap him and take him home. My tail complex has officially overloaded. And I absolutely adore No. 6! Watched the first episode after it came out and have been obsessive since. …Yep, my brain’s officially broken. Ohmygod!! !XD <3 He. Is. TOO. CUTE. XD I can't decide which is my favorite, Panel 7 or panel 8!! maybe 8 because of Wiggy's happy lil "aw I couldn't help myself!" face! GAH Lily, why are you so awesome? Hmmm. 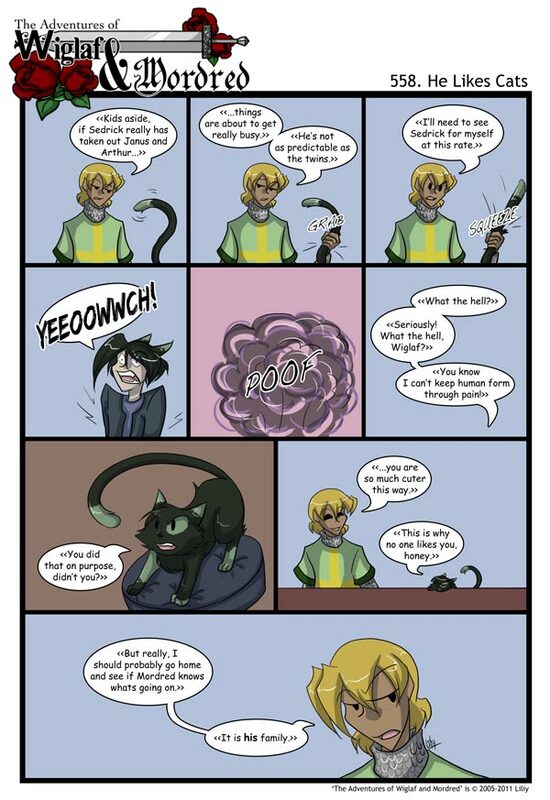 Okay, he’s a shapeshifter rather than an anthrofeline (catboy). That gives him enough leeway for me to take him off the hunting list. Have to wonder what Mordred will think of his older siblings being taken out by Seddie. Herschell is cool. Are you ever going to explain him in canon?